A GST registration obtained in India can be cancelled by the registered person or by an Officer or by the legal heirs, in case of death of person registered under GST. GST registration cancellation is different from GST Registration amendment. In this article, we look at the procedure for GST registration cancellation in detail. Who Can Cancel GST Registration? An Officer under GST can either on his own accord or an application filed by the registered person or by legal heirs of the registered person , in case of death of such person, can cancel a GST registration. However, a person who obtained GST registration voluntarily cannot apply for GST Registration cancellation before the expiry of a one year from the effective date of registration. Issues invoice or bill without supply of goods or services in violation of the GST Act and/or GST rules. Prior to cancellation of registration, the Officer would issue a notice to such person whose GST registration is liable to be cancelled, requiring show cause within 7 working days from the date of service of such notice as to why the GST registration should not be cancelled. The registered person can reply to the show cause notice within the prescribed time or the GST registration can stand cancelled. Discontinuance or closure of a business. Transfer of business for reasons of amalgamation, merger, de-merger, sale, lease or other pertinent reasons. Change in the constitution of business, which results in a change of PAN. Taxpayers who are not under the mandatory net of GST. Death of the sole proprietor. Any other reason, the likes of which must be substantiated in the application. All registered taxpayers other than those who are regulated under rule 12, which covers registered persons requiring to deduct or collect tax at source, and Taxpayers granted with UIN. The legal heir of a registered person. An application for cancellation is to be made in Form GST REG-16 on the common GST portal within 30 days of the “occurrence of the event warranting the cancellation.” In certain scenarios where it is tough to identify the exact date of the event, the deadline can be interpreted in a liberal manner, in which case the application would not be rejected on the possible violation of the deadline. Contact address, which includes the mobile number and e-mail address. The desired date of cancellation. Particulars of the value and the tax payable on the stock of inputs, the inputs available in semi-finished goods, inputs available in finished goods, the stock of capital goods/plant and machinery. Particulars of registration of the entity wherein the existing unit have been merged, amalgamated, or transferred. Particulars of the latest return filed by the taxpayer along with the ARN of the particular return. 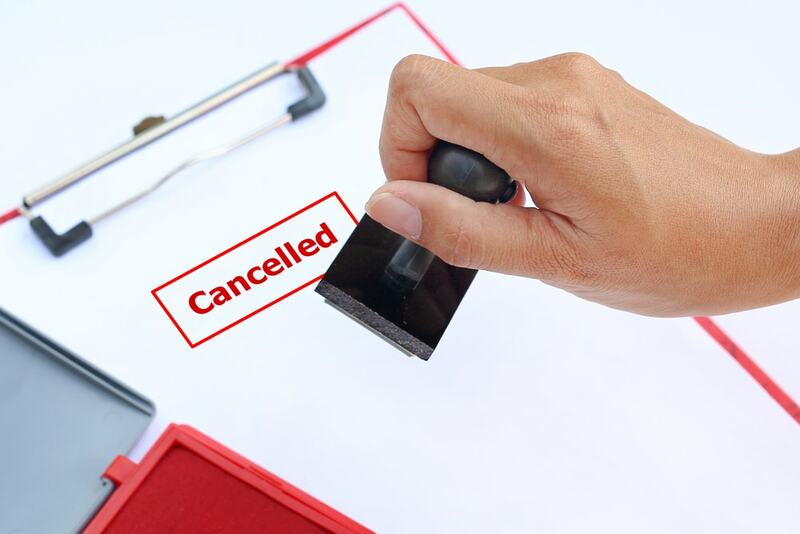 While applying for a cancellation, the applicant is mandated to pay the input tax contained in the stock of inputs, semi-finished goods, finished goods, and capital goods or the output tax liability of such goods, whichever is higher. The payment can be made through debiting either the electronic credit or cash ledger. The obligation, though considered essential, may even be fulfilled during the submission of final return in GSTR-10. The submitted application is incomplete. 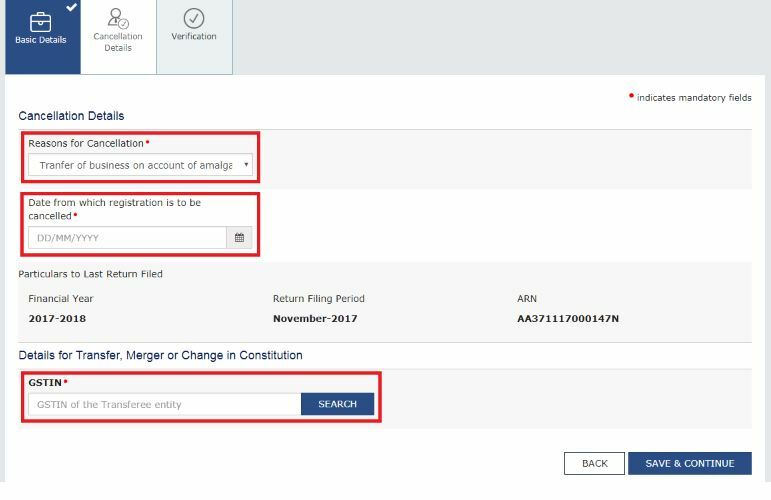 Where in the event of transfer, merger or amalgamation of business, the new entity hasn’t registered with the tax authority prior to the submission of application. In these situations, the concerned officer provides a written intimation to the applicant regarding the nature of the discrepancy. In which case, the latter is required to respond to the same within seven days of the date of receipt of the letter, failing which the concerned officer may reject the application after providing him/her with an opportunity to be heard. The reasons for rejection must be recorded. Every person whose registration has been cancelled are required to file a final GST return in Form GSTR-10 within three months of the date of cancellation or the date of order of cancellation, whichever is later. This is done to ensure that the taxpayer is devoid of liabilities which could have been incurred under Section 29 of the CGST Act. The due date stipulated for the same is the 31st of December 2018. It may be noted that Input Service Distributors or non-resident taxpayers who are required to pay tax under section 10, section 51 or section 52 are exempted from this provision. 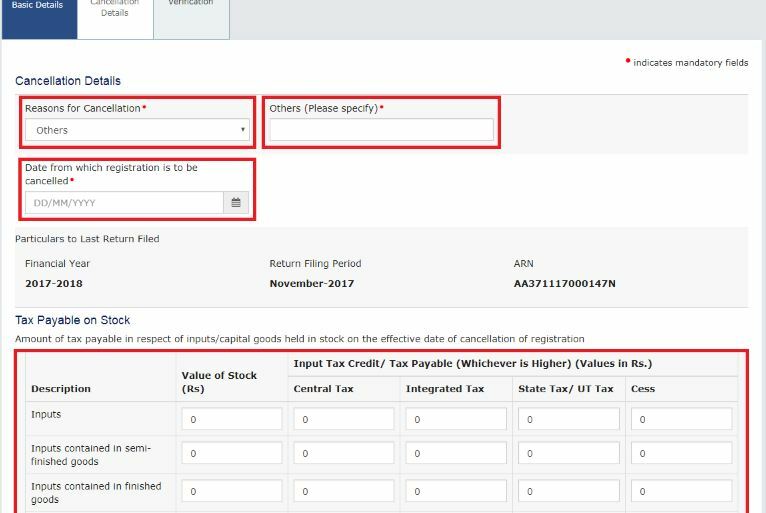 If the final return isn’t filed in Form GSTR-10, the taxpayer will be issued a notice in GSTR-3A, prompting him/her to do the same within 15 days of the issue of such notice. If the taxpayer fails to comply with the notice, initiatives will be taken to assess the liability of the taxpayer based on the information available with the concerned officer. The assessing order will be withdrawn if the applicant files the return within 30 days of the issue of notice. However, the taxpayer wouldn’t be reprieved of remitting the late fee and interest. 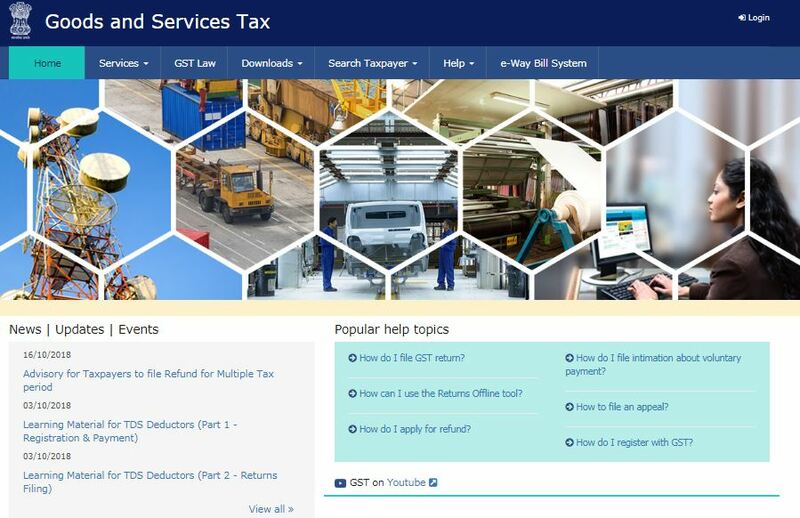 Step 1: Firstly, the taxpayers have to visit the Goods and Services Tax portal for the Cancellation of GST Registration. Step 2: Click on the ‘Login’ button to access the username and password page. Step 3: Enter the correct ‘Username’ and ‘Password’ credentials along with the captcha in the required field and click ‘login’. Step 4: You have to click on the Application for Cancellation of Registration link under the services tab that is visible on the home page. Step 5: The Cancellation of the Registration form with various tabs is displayed. There are three tabs such as Basic Details, Cancellation Details and Verification. Click on each tab to enter the details. 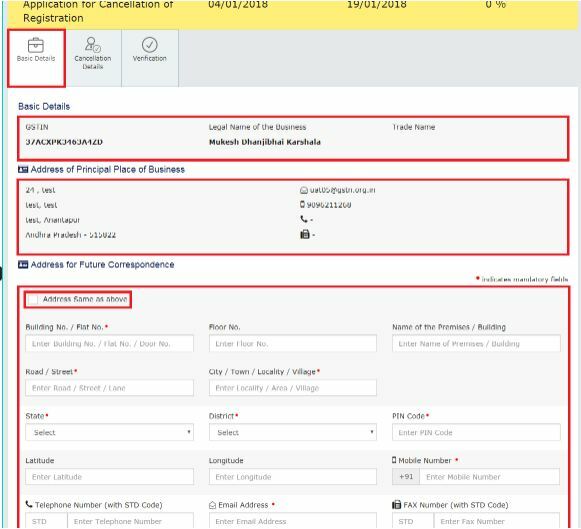 Step 6: The Basic Details tab is selected by default; it displays the information that is pre-filled in the sections of Basic Details and Address of Principal Place of Business. 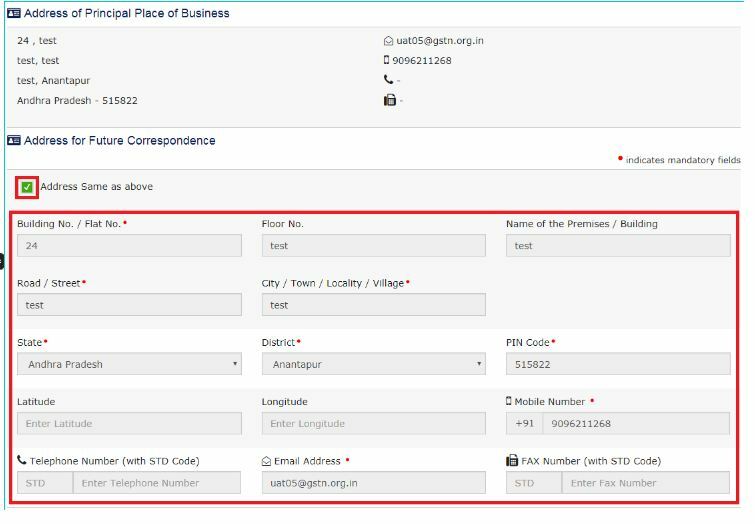 Step 7: You must fill your address manually for future correspondence, or check the Address option same as the above to copy the same address as in the Address of Principal Place of Business field. Step 8: Then click on the “Save and Continue” button. 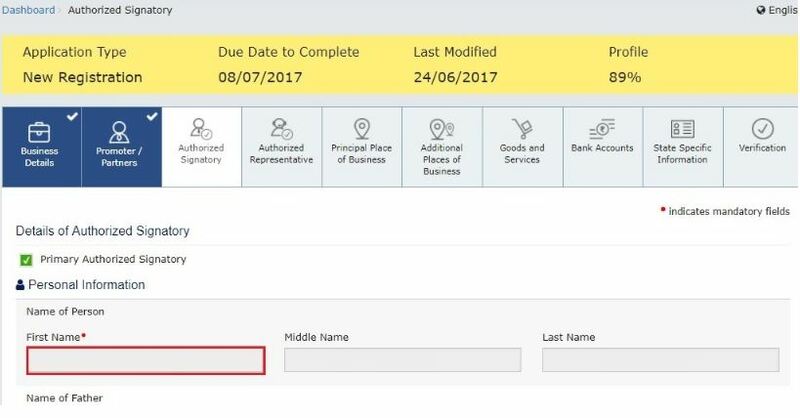 A blue tick will appear on the Basic Details section indicating the completion of the Basic details. You can now proceed with the next tab. 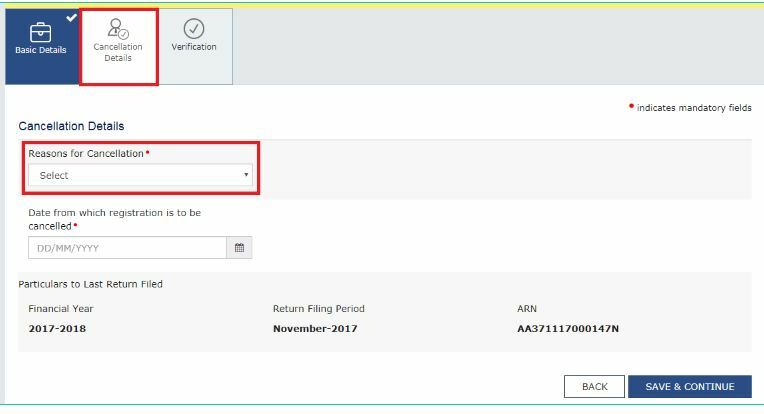 Step 9: The next tab Cancellation Details will get active after you have been duly filled-in all the mandatory fields under the Basic Details tab. Step 10: You have to select a suitable reason from the Reason for Cancellation drop-down list. Transfer of business on account of amalgamation, de-merger, sale, leased or otherwise. You have to give the date from which registration is to be cancelled. Then enter the GSTIN of the transferee entity under the Details for Transfer, Merger or Change in Constitution section. The system will validate the same, and based upon its Legal Name of Business, will auto-populate the Trade Name. Then you have to click on the “Save and Continue” button. You have to enter the value of stock and also the corresponding tax liability on the stock. Basis the entered stock details, you need to manually enter the value to offset the liability that you want to offset from either the Electronic Credit Ledger, or the Electronic Cash Ledger, or both. On submitting the application form, the amount will be deducted from the respective Electronic Credit Ledger, or the Electronic Cash Ledger, or both, and debit entries will be made. You have to specify a proper reason for the GST cancellation. Step 11 – Transfer of business on account of amalgamation, de-merger, sale, leased or otherwise. 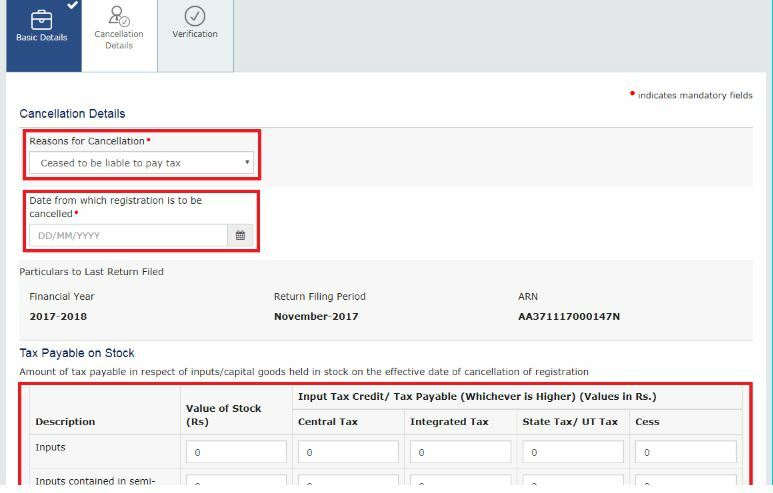 Step 12: The next tab verification Details will get active after you have been duly filled-in all the mandatory fields under the Cancellation Details tab. Step 13: Check the Verification statement box to declare that the information given in this form is correct and true and that nothing has been concealed therefrom. Step 14: Select the name of the authorised signatory from the Name of Authorized Signatory drop-down. Note: The system auto-populates the authorised signatory’s designation or status. Step 15: Enter the Place of making this declaration. Step 16: Sign the form by using either your Digital Signature Certificate (DSC) or the EVC option. On selecting any of these below options, you will receive an OTP. Step 17: If using a DSC, you will be required to select the registered DSC from the emSigner pop-up screen and then proceed from there accordingly. 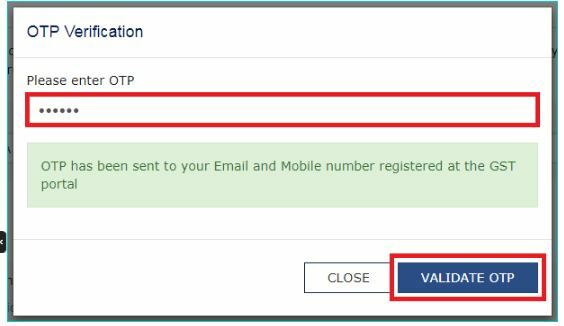 Step 18: Enter the OTP that you have received and then click on the Validate OTP button. 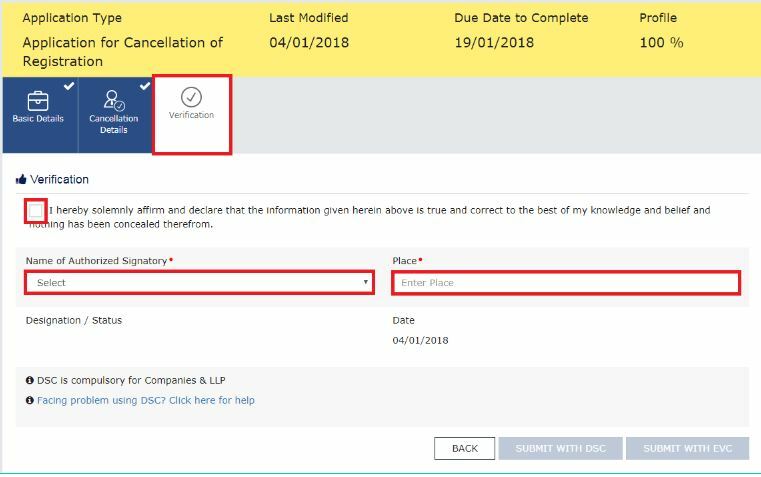 Step 19: On successfully filing the application for cancellation of registration, the system will generate the ARN and display a confirmation message. 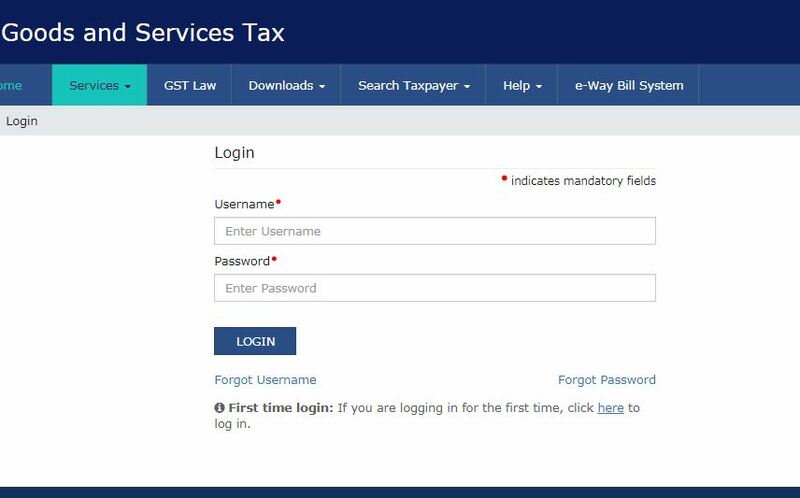 Step 20: GST Portal will also send a confirmation message on your registered mobile phone number and e-mail-ID. Step 21: After this process, the concerned Tax Official will review your application and take a decision accordingly. Step 22: To view the ARN, you have click on the “Track Application Status” under the services tab that is visible on the home page. Step 23: Select the Submission Period radio button. Step 24: Enter the From and To dates between which you filed for cancellation of registration. Step 25: Click the Search button. 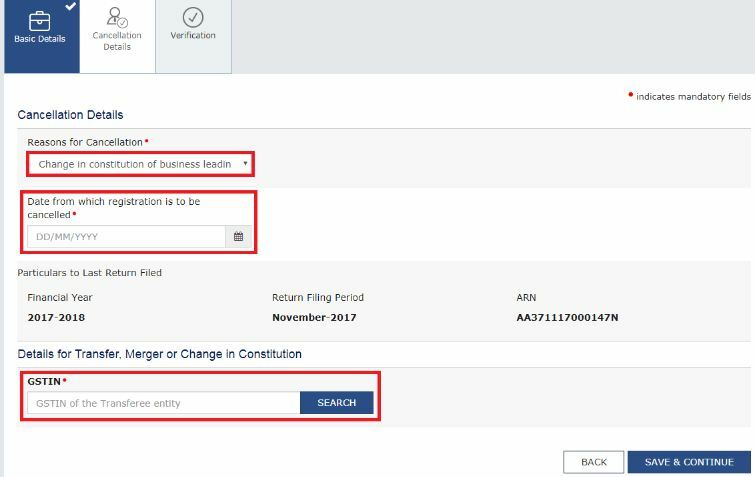 On clicking on the ‘search’ button, will display the ARN corresponding to your filed application along with the status. In case a GST registration application is cancelled involuntarily by a GST Officer, an application for revocation of cancellation of registration can be filed. 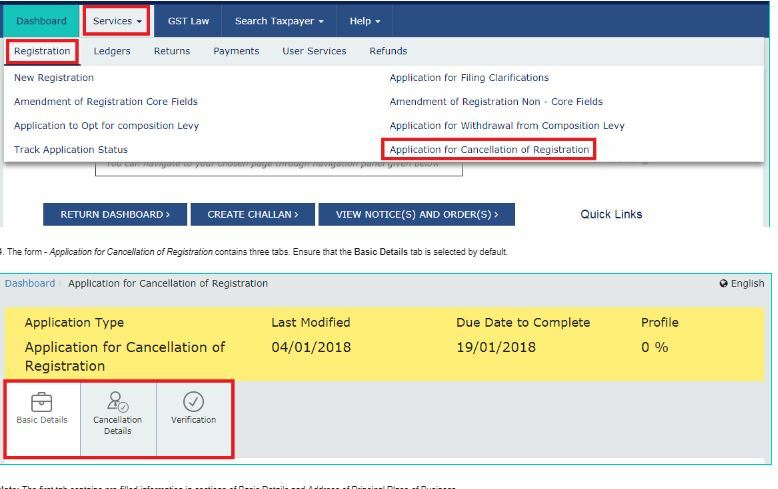 All application for revocation of cancellation of GST registration must be filed within 30 days of order of cancellation of GST registration on the GST common portal. If a GST registration was cancelled due to failure in filing GST returns, then an application for revocation of cancellation can be filed only after filing the GST returns and paying any amount due as tax, along with any amount payable towards interest, penalty and late fee payable. 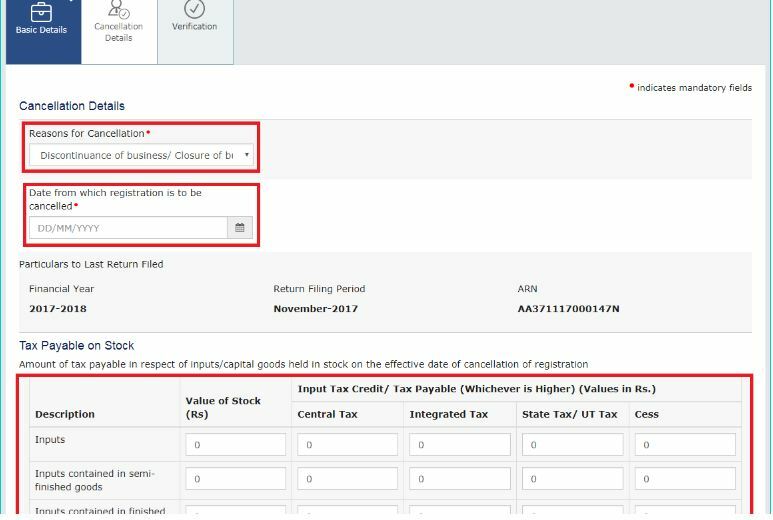 After filing the delayed GST returns and paying the penalty, an application can be made by a taxpayer for revocation of cancellation of registration. The GST Officer would then verify the reasons for revocation of cancellation of registration, and if satisfied about the grounds for revocation of cancellation of registration, he would revoke the cancellation of registration.